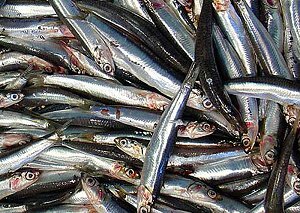 for Anchovy, canned in oil & drained. Anchovy Basil Sauce - Egg yolks, Chablis, white wine vinegar, garlic, shallots, and anchovies. Anchovy & Chicken Liver Savory - Chicken livers, anchovy fillets, buttered toast, parmesan cheese. Anchovy Italian Copenata - Eggplant, celery, carrot, onion, wine vinegar, canned tomatoes, tomato paste, green olives, capers, anchovy fillets. Anchovy & Olive Pizza - Yeast, flour, onions, garlic, oregano, tomatoes, anchovy fillets, pimento stuffed olives, parmesan cheese, mozzarella cheese. Anchovy & Tomato Sauce - Anchovy fillets, garlic, olives, plum tomatoes, oregano. Zesty Anchovy Appetizers - Swiss cheese, chopped anchovies, chopped parsley, mayonnaise, lemon juice, rye bread. Anchovy Deviled Eggs - Hard boiled eggs, anchovies, mayonnaise, Dijon mustard, lemon juice, parsley, capers. Anchovy Garlic Dressing for Salads - Anchovy fillets, garlic, balsamic vinegar, lemon juice, Dijon mustard, olive oil. Anchovy Olive Dip - Anchovy paste, sour cream, green olives, grated onion. Anchovy Spread - Anchovy fillets, milk, cream cheese, lemon juice, nutmeg, hot pepper sauce, capers. Anchovy Stuffed Olives - Pitted olives, anchovy fillets, pimentos, wine vinegar, garlic, olive oil, parsley. Eggplant & Anchovy Pasta - Eggplants, anchovy fillets, olive oil, garlic, canned tomatoes, flour, milk. Anchovy Butter - Anchovy fillets, butter. Anchovy Sauce - Anchovy fillets, butter, garlic. Anchovy Toast - Anchovy fillets, garlic, mustard powder, onions, capers, red pepper, parmesan cheese. Anchovy Wine Cheese Spread - Anchovy fillets, cream cheese, sherry wine, green olives. Anchovy Yoghurt Dressing - Anchovy paste, low fat yoghurt, garlic, oil. Anchovy Zuppetta - Anchovies or sardines, jalapenos, almonds, red onion, white wine, tomato sauce, scallions, basil, mint. Avocado Anchovy Dressing - hot pepper sauce, lemon juice, Worcestershire sauce, salt, mayonnaise, avocados, green onion, garlic cloves, and anchovies. Barramundi Fillets on New Potatoes - Barramundi fillets, new potatoes, black olives, capers, anchovy fillets, vine ripened tomatoes, herbs, pine nuts, balsamic vinegar, salad leaves.